We conducted 40 m long profiles to observe spatial changes in the GPR character across the prototype surface barrier. We also visited the prototype surface barrier site four times, March, May, and September 2001, and January 2002, to determine the change in soil moisture during the different seasons of the year. At Hanford, winters are cool and wet accounting for most of the precipitation, and the summers are warm and dry. This testing methodology allowed us to observe changes in EM energy travel times that we could relate to changes in soil moisture content. We acquired several CMP surveys at the beginning of the March field experiment to determine the optimal offset to collect the WOR data (Figure 23.2). The optimal offset was based on the time separation of the air and ground waves. We wanted to avoid interference between the two phases so we could accurately pick the ground wave arrival time and amplitude. If the separation is too close, the air wave will interfere with the later arriving ground wave and potentially cause a misinterpretation of the arrival time and the amplitude. From the March CMPs, we chose an optimal antenna separation of 3.5 m. The character of the GPR data changed substantially during the May and September field experiments. Fortunately, the 3.5 m offset still allowed picking of the ground wave. Attenuation of the wave's amplitude due to larger separation would have made picking the ground wave unreliable. 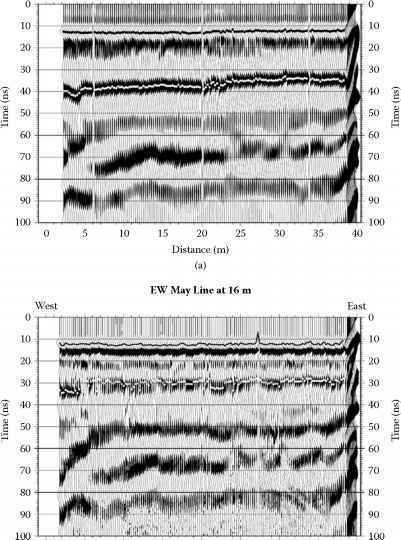 Processing of the GPR data consisted of a few standard procedures. We removed low-frequency noise due to the electronics in the radar unit from the data. For the CMP analysis, we bandpass filtered the data between 25 and 200 MHz to increase the signal-to-noise ratio of the arrivals. The WOR data were not filtered. For plotting the images, we used a gain function to emphasize the later arriving events (AGC) with a 25 ns window. Figure 23.2 compares CMPs from the same location for the four acquisition dates. For the March and January data, the ground wave is a strong event. The May data shows a weaker, less-extensive ground wave. (We have displayed the highest-quality CMP survey from the May profiles). The September CMPs show weak ground wave arrivals. In the March and January CMPs, the ground wave projects to arrive at 10 m antenna separation at approximately the same time (~86 ns for March; ~88 ns for January). Thus, their slopes are nearly equal, indicating that the EM velocity of the ground wave is about the same for each date. In May, the ground wave projects to arrive at ~75 ns at 10 m antenna separation. This earlier arrival time indicates that the EM velocity is faster in May. The GPR data were acquired with the same parameters for each survey, except the stacking change mentioned earlier. Each survey was started with a walkaway to help reliably identify the air and ground waves (Figure 23.4). By starting the survey with the walkaway geometry, we can more confidently pick the air and ground waves from the slope and the time intercept of the phases (Figure 23.5 and Figure 23.6). In GPR data, the input waveform has a central, large amplitude peak flanked by two smaller peaks. We picked the central peak for analysis. In addition, the air wave has the opposite polarity from the ground wave providing more confidence in the event picking (Du and Rummel, 1994). Thus, in the presented data, the air wave has a negative (white) amplitude, whereas the ground wave has a positive (black) amplitude. The surface spatial location of these events is known, so we can reference our findings to the ground location. 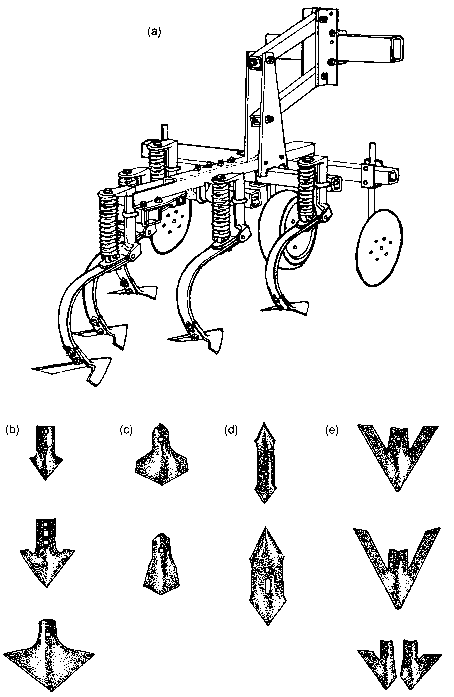 Two aspects of the character of the WOR GPR surveys are easily observed in Figure 23.5 and Figure 23.6. First, the ground wave is a strong-amplitude, coherent event in the March and January data. The ground wave in the May and September data is weaker in amplitude, more difficult to see, and not as coherent. Fortunately, the walkaway start of each survey makes picking the ground wave more reliable. Second, the arrival time of the ground wave varies between about 35 and 40 ns in the March and January data but occurs at about 30 ns in the May and September data. The earlier ground wave arrival indicates that the EM velocity is faster in May and September compared to March and January. FIGURE 23.5 The wide-offset reflection (WOR) data from (a) March and (b) May. Note the weaker ground wave amplitudes and the earlier arrival times in the May profile compared to the March profile. The air wave picks are marked by the black line; the ground wave picks are marked by the light gray line. Bad picks on the right side (walkaway stage) of the sections are due to a poorly defined picking window and are ignored in the interpretation. rates of evapotranspiration in the summer months. During the winter months, higher precipitation and reduced evapotranspiration cause an increase in soil moisture.